Sciblogs | Does healthy food really cost more? Does healthy food really cost more? There is a perception that healthy food costs more – but does it really? It all depends on how you measure the cost. This blog post looks at some of the different metrics and suggests that we need to consider several of them to get a better understanding of this important issue. Monitoring the price of foods allows us to see if a healthy diet is affordable, and to advocate for fiscal policies that encourage consumption of healthy foods and discourage consumption of less healthy foods. However, there seems to be little consensus on how best to measure price – per calorie? Per gram? Per serve size? This blog post explains how the use of different price metrics changes the result. It also goes on to outline a more robust measure – costing healthy vs less healthy diets, rather than individual foods, with research underway at the University of Auckland to measure this. That said, comparing the price of specific foods over time is also useful to monitor relative price changes and this blog post discusses recent monitoring over a decade from the UK that showed the rise in price was steeper for healthy food. There is currently no consensus in the literature about the best way to measure the cost of healthy versus unhealthy foods. Table 1 outlines commonly used metrics and summarises the pros and cons of each. So how do shoppers measure price? Measuring foods per 100g and per serve reflects the information available at point of purchase – is this box of breakfast cereal cheaper? Which yoghurt is cheaper per 100g and thus provides best value for money? Some shoppers will be looking for food to fill their families at the lowest possible price. Even though the price per calorie is not available at the point of purchase, most shoppers instinctively know which foods are cheap and filling. A very cheap, healthy menu can be constructed but a diet with lots of cabbage, lentils and rolled oats doesn’t hold much appeal for the average NZ household. Wilson et al (2013) (1) identified a low-cost diet for NZ$3.17 a day but when more familiar foods were added the cost increased. All metrics have some relation to the way shoppers make purchasing decisions. The issue of how to measure price change was recently highlighted in a paper by Jones et al (2014) (2). Changes in the price of 94 common individual food items from the UK Consumer Price Index (CPI) were assessed in 2002 and 2012. Foods were categorised according to nutrient profiling. In 2012 the healthy foods were on average, three times more expensive than the unhealthy foods per 100 calories and the rise in price over the decade for the healthy foods was steeper. In addition, foods were assigned to a food group. Price per calorie was highest for fruit and vegetables, lowest for grains, and second lowest for ‘foods and drinks high in fat and/or sugar’. The authors concluded that healthier foods and beverages have been consistently more expensive than less healthy ones. Other authors report similar findings. Davis and Carlson (2014) (4) used a simple regression model to test the relationship between food price and energy density for 4430 foods. For almost all of the foods the relationship between food price and energy density was due to the way the data units were constructed – not from any direct relationship between food price and energy density. The USDA Economic Research Service (Carlson & Frazao 2012) (5) compared a range of price metrics (per 100g, per serve, per 100 calories) for core and discretionary foods (foods high in saturated fat, sodium (salt) and/or added sugar) to see if there was any consistency between metrics (Figure 1). Grains were one of the least expensive groups for all metrics. Protein foods were the most expensive per 100g and per serve, but ranked in the middle per 100 calories. Vegetables were the most expensive per 100 calories, but one of the less expensive per 100 grams and per serve. 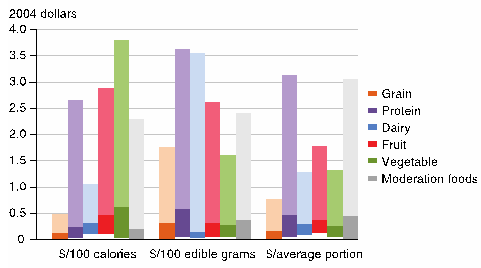 Discretionary foods ranked in the middle for price per 100 calories and 100 grams but were one of the most expensive groups per serve. The overall rankings of food prices were statistically different between each metric with price per 100 calories differing the most from the other two. The authors concluded that the metric used has a large effect on which foods are more expensive. Figure 1: The prices of healthy versus less healthy foods vary with the measurement method. I reached a similar conclusion after exploring different metrics for the cost of common foods and drinks in the NZ Food Price Index (Figure 2). Food items were categorised into core food groups and discretionary foods according to our NZ Food and Nutrition guidelines. The average price of nine commonly consumed vegetables was $0.47 per 100g yet $1.97 per 100 calories. The cost of discretionary foods (including snacks, sweets, beverages and takeaways) was $1.51 per 100g yet $0.59 per 100 calories. So which is really more expensive – vegetables or takeaways? It is easy to calculate the cost per 100g but this doesn’t reflect the amount of a food that is typically eaten. For example, a typical serving of marmite might be 5g (1 teaspoon), and a typical serving of bread might be 80g. However, these two foods would have equal weighting when creating an average price per 100g. Instead, the cost per serve can be calculated but this is difficult to standardise – the amount of marmite one person puts on their bread could be quite different to another person. The price per calorie relates better to food poverty, but is price per calorie the right measure considering our high rate of non-communicable diseases, and our obesogenic environment where people often eat more energy than required? A New Zealand study found that substitution of commonly purchased supermarket food items with a similar healthier item did not substantially alter the cost of the overall basket of food, but healthier options were more expensive for meat and poultry, butter and margarine and cheese (6). Fruit and vegetables were not included in either study as it is difficult to find an unhealthy comparator. So how should NZ researchers and agencies measure prices? One aspect that all researchers agree on is that food prices should be routinely monitored in a standard, systematic way to inform possible economic policy to ensure a healthy diet is affordable. In New Zealand the Food Price Index monitors the price of a basket of food monthly (7). Also, the annual University of Otago Food Cost Survey (8) calculates the cost of a healthy diet (basket of food) for a household for one week. The diet is based on the NZ Food and Nutrition Guidelines using common foods consumed in the NZ Adult Nutrition Survey. However there is currently no routine monitoring which compares the cost of healthy food to unhealthy food, and there is no consensus on which price metric to use. Instead, the cost of a healthy diet, relative to the cost of the current population diet, should be considered. Very few studies have constructed menus and shopping baskets to do this. Researchers in Australia are currently investigating the cost of a healthy food basket and a typical food basket (higher in saturated fat, added sugar and sodium, lower nutrient density) that will feed a household for a week. INFORMAS (International Network for Food and Obesity / Non-communicable Diseases Research, Monitoring and Action Support) aims to monitor, benchmark and support public and private sector actions to create healthy food environments. I am currently developing the INFORMAS food prices module to measure the cost of a healthy and a less healthy diet in a standardised way over time and between countries for my doctorate with the University of Auckland. Measuring the cost of healthy and less healthy diets is a more transparent way of answering the question – does healthy food cost more? For now, next time you see a headline about the cost of food, you could look closely at how the cost of food was measured, if all food groups were included or was the cost of the diet measured. 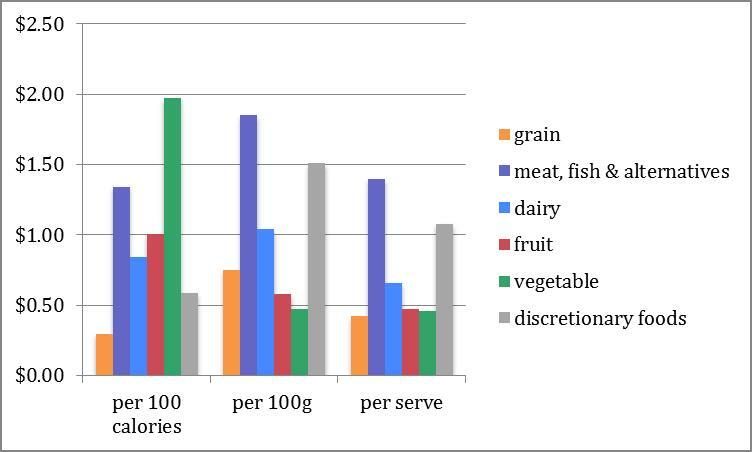 Measuring the cost of specific foods is useful for monitoring changes in prices of healthy and less healthy foods over time but the cost of the entire diet needs to be measured to determine if a healthy diet costs more. This has not been done in New Zealand so you will need to be patient and wait for the results of my research next year to find out if a healthy diet costs more. Finally, it is recognised there are many other important factors in assessing the price of food, which although outside the scope of this blog, are important to consider. These include food wastage and the impact of food production on the environment. Buying cheap fruit is not a bargain if you throw half of it away. A thorough analysis of the cost of food should account for the cost of greenhouse gas emissions, polluted waterways and loss of biodiversity from food production. Currently, the price paid by the consumer won’t reflect the ‘real’ cost of the food. Acknowledgements: The author thanks Cliona Ni Mhurchu, Tony Blakely, Nick Wilson and Helen Eyles for editorial comments on this blog. Wilson N, Nghiem N, Ni Mhurchu C, Eyles H, Baker M, Blakely T. Foods and dietary patterns that are healthy, low-cost, and environmentally sustainable: A case study of optimization modeling for New Zealand. Plos One 2013; 8(3), e59648. Jones N, Conklin A, Suhrcke M, Monsivais P. The growing gap between more and less healthy foods: Analysis of a novel longitudinal UK dataset. 2014; PLoS One 9(10): e109343. Burns C, Sacks G, Rayner M, Bilenkji G, Swinburn B. Correctly calculating the cost of food. Nutrition Reviews 2010; 68(3): 182-183. Davis G, Carlson A. The inverse relationship between food price and energy density: Is it spurious? Public Health Nutrition 2014;Jun 3:1-7. Carlson A, Frazao E. Are healthy foods really more expensive? It depends on how you measure the price. Economic Information Bulletin 2012;96. Washington DC: Economic Research Service, USDA. Ni Mhurchu C, Ogra S. The price of healthy eating: Cost and nutrient value of selected regular and healthier supermarket foods in New Zealand. The New Zealand Medical Journal, 2007120(1248). Statistics New Zealand. Food Price Index. September 2014. Department of Human Nutrition. 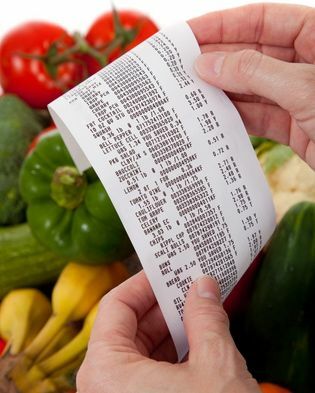 Information package for users of the New Zealand estimated food costs 2014. 2014: Otago: University of Otago. I tihnk some people (typically politicians) try and overcomplicate things with regards to what is defined as healthy. Also with regards to healthy food costing more, with fruit and vegetables it depends on what is in season – event the more expensive items (e.g. avocados, asparagus etc) can be bought at a good price at certain times of the year. Also, for those with a green thumb and garden space you can grow your own fruit and veges.